The non-stop puzzle action of Bust-A-Move is now on your Nintendo Wii! Old favorites Bub and Bob return with some new friends and game modes designed to take advantage of your Wii Remote. Face an all angle assault of bubbles in Shooting Mode, play up to 7 friends in VS. Mode, test your endurance in Endless Mode, or enjoy the classic Puzzle Mode from previous iterations of the franchise. 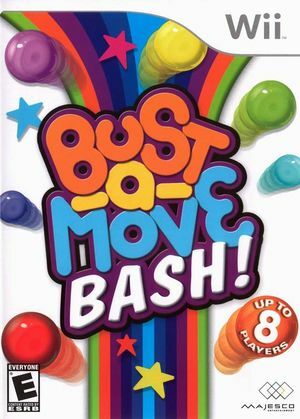 If you're just discovering the challenging puzzle action, or are a returning expert bubble launcher, you'll be sure to find loads of bubble bursting fun in Bust-A-Move Bash! (more simply Bust-A-Move in Europe). The graph below charts the compatibility with Bust-A-Move Bash! since Dolphin's 2.0 release, listing revisions only where a compatibility change occurred.